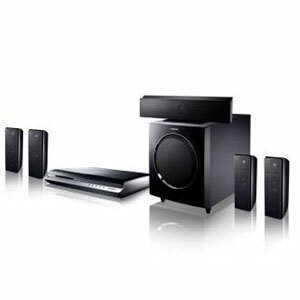 Samsung is now offering a new home theater in a box (HTiB) with Blu-ray at $799 (SRP). The HT-BD2E features a 800W 5.1 speaker package and an integrated receiver with Blu-ray player, this is the lowest priced Blu-ray HTiB system yet. The Blu-ray player features BonusView, which is a mandatory function now. It outputs 1080p at 60fps or 24fps, depending on the source material. The HDMI output works with other HDMI-CEC compliant devices from Samsung, such as a TV. This allows for one remote to control multiple devices. Samsung has two other Blu-ray HTiB systems, one for $999 and another at $1,499.